It’s time for Friday Fictioneers, hosted by the wonderful Rochelle Wisoff-Fields. Writers are invited to write a 100-word story based on photo prompt. This week’s photo was provided by Jennifer Pendergast. Thank you, Jennifer. 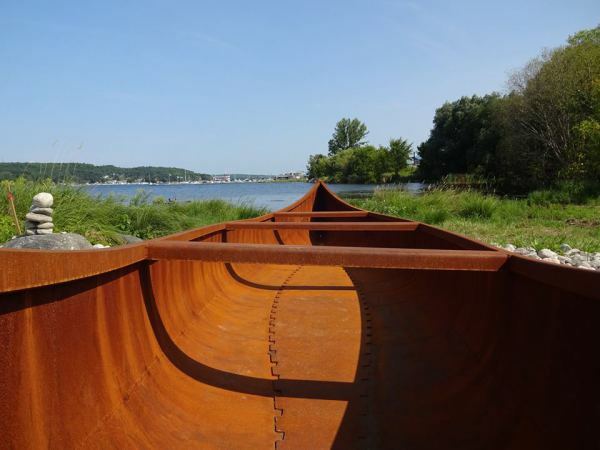 A man spilled out of the rusted canoe onto the green earth and stared at the sky with a dopey smile. Margo halted her rigid pace of her daily walk to stare at his attire; a feathered hat, striped pants and boots. “No, madam. I’m home.” He jumped to his feet and kissed her hand. “You’re the first, so get on.” He nudged her inside the slopping water. “But you did. There’s no altering the course. Don’t even try.” He waved to her. The canoe accelerated, its rust sliding off like an old skin. Click here for more stories from the Fictioneers. Feel free to join in. Previous It Costs How Much? I don’t know…have you? In some other time and place, perhaps? Thanks! Somehow I pictured angels differently, but he sounds charming. 😉 At least that’s what I’m gleaning from your title. Nicely written. Thanks so much. I was thinking more that this canoe is like a time machine of the water. I love your interpretation though and can see how you arrived at that. Thanks for your thoughts and your lovely comments. I’m a sucker for people with dopey smiles. I suspect an adventure is about to begin. Hand me a paddle. Me too, Russell. I’d jump in, too. What do we have to lose? Thanks. Thank you, Jen. It’s supposed to be a record 109 today? Did you say the summer was over? I would jump into this rusty canoe in a heartbeat. Ali, I envisioned the canoe as a time machine of the water. She must jump in to keep it going. I couldn’t explain the rules in my 100 words, but that’s what I was thinking. I think he’s just glad to be on land. Thanks for reading. Oh I guess there is not an end to this.. never more an end. No it’s time for Margo to find here way back..
Nope, it never ends. The ride that doesn’t stop and when it’s too rusty, it’s starts over! Perhaps Margo will like her destination. I’d have gone with Noah, or maybe Charon. Thanks, Guap. I enjoyed your story very much. Yours was cool. Pingback: Friday Fictioneers – Captains | Alphabet Soup. Without the slurping! I think he’s either the Lucky Charms Leprechaun or the Keebler Elf. Just thought I’d provide a different twist. Thanks, Frank! I always love to hear your thoughts. Hey, and he could be little. Why not? Love it… we can imagine whatever scenario we want! Thanks, Dale. I’m glad you enjoyed it. You most certainly can imagine whatever you like. I won’t stop you. I’m lost but perhaps that is part of the journey. The mood of this piece is so hopeful even though I’m in the dark. Thanks, T. You’re not the only one who is lost on this journey. 🙂 This canoe is a time machine of the water. I was hoping “Fantasy” was a clue. Anyway, it makes sense in my head since I know what’s going on. Ha ha. I’m glad the mood is hopeful at least. A time machine.. well done Amy. Loved the idea and the striped pants and a feathered hat.. Thank you, Dee. Glad you enjoyed it. Thank you, Helen! That’s the canoe great transformation. Glad you enjoyed it. Wherever we wind up on the boat, I hope there’s cable. If we’re going back further than that, I gotta pack! Eager to see what comes next. I’m with you! As long as there’s at least Netflix on the canoe. Whatever happens, Perry, remember the course is set. Are you game? This reads like the beginning of a fun, wild, fantastic and adventurous tale. I saw him as faerie as well, but time machine works for me, too. Off you go, Margo, don’t hesitate. Yes, don’t hesitate and don’t delay. The canoe will not be waiting. Thanks for your thoughtful comments, Gah. Glad you enjoyed it. Delightful – sounds like the beginning of a very intriguing adventure. Thank you, Erin. Hopefully, she’ll like her new digs. I think I’ve read this in a slightly different way, Amy. I saw the dopey-smiled man as some kind of dapper grim reaper, with Margo being the next person for him to take to her next destination. Bright and dark at the same time. Mind you, I love a good paradox, I do. Good, intriguing story you’ve written here, Amy. Well now, Tom, that’s why I love everyone’s thoughts. I don’t think stories are ever meant to be interpreted the same way for everyone, because I think people bring their own experiences into the story. I think Margo is going to have a good time, but it could be filled some dark moments. Such is life. Thank you, Tom, and thanks for your thoughtful comments. Right, and apparently, she doesn’t seem to have much choice in the matter. In a way, it seems like it would be a great way to start an adventure. You have no choice but to go! I really like the idea of it being a time machine! Thanks, PJ! Me, too. The water has that kind of infinite quality, unless you run into a bank or a shore or something. Just give a little push and you can be on your way. A very inventive take. I love the watery time machine idea, and your feather-hatted charaacter is delightfully quirky. Fantastic. This brought Rip van Winkle to my mind, which seems to have been about right. I wonder where/when the canoe will take her. I was a little lost. I thought he’d come from a different time but the last two pieces of dialogue confused me. The comments have cleared things up. Great idea Amy. Well, you got the bit about him being from a different time. Yay! I know it’s one of those stories that seem to have a lot of different interpretations. I do like the idea of this though. Maybe I could go somewhere with it. Thanks for your feedback, Louise. That’s the thing I love most about Friday Fictioneers – reading all the different interpretations. Sir Walter Raleigh, perhaps, in a new role? Smile-making, Amy. I wish I could meet a dopey-smiled time traveler on my walks. 🙂 Lovely story Amy! Me, too. That might change things up a bit, right Jolly? Thanks, glad you enjoyed it! This fellow seems to be like a lot of characters. Thanks so much for your feedback. I’m thrilled it seemed magical. Thanks, Suzanne! Can you imagine? (Well, I guess you can as you wrote this.) How wonderful to just step on a boat and set off on an adventure not knowing anything. Where? How long? What will happen when I don’t return to my normal routine? I envy her, her ride. After I wrote this fantasy piece, I realized it doesn’t even to need to be this genre. Even with a more realistic story, just stepping inside that boat and sailing away is fantasy all on its own. Wouldn’t that be dreamy??!! Just to leave your life behind for a while. I guess that’s supposed to be vacation, but somehow having to plan it all creates all those expectations, stress, etc. Wouldn’t it great to just have that all taken care of and have it all be perfect! I think “perfect” would be exactly the right word to describe it. And does “perfect” exist? I hope so. Cool … so many interpretations for this ending … love what you did with such restricted writing space! True, there are lots of ideas about this one. I’m thrilled people had so much to say about it. Thanks so much! Something to be thrilled about … bravo once again! Oh, I’m late, but here! LOVE this one, Amy… so mystical and prophetic. The imagery is sharp and the storytelling really wonderful! Glad I saved it, but will be happier when I’m caught up on things I enjoy… like your writing!